Not everyone has a sunny disposition, so we thought we'd make a set of notebooks for the grumps of the world. 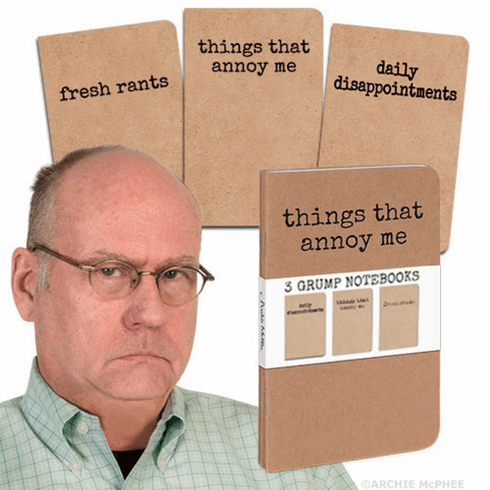 This is a set of three 48 page, 5-1/2" x 3-1/2" (14 cm x 8.9 cm) notebooks labelled Daily Disappointments, Things That Annoy Me and Fresh Rants. Each has ruled paper and a pocket in the back to hold extra complaints. These are perfect for keeping notes of bad reviews, remembering what you're mad about and making lists of things you're dreading. Set of three attached with paper band and bagged. ISBN.